What better way to celebrate our Nation’s 241st birthday than with a hot dog, fries and a cold beer? We found just the place for you to do that with a twist on an old favorite. 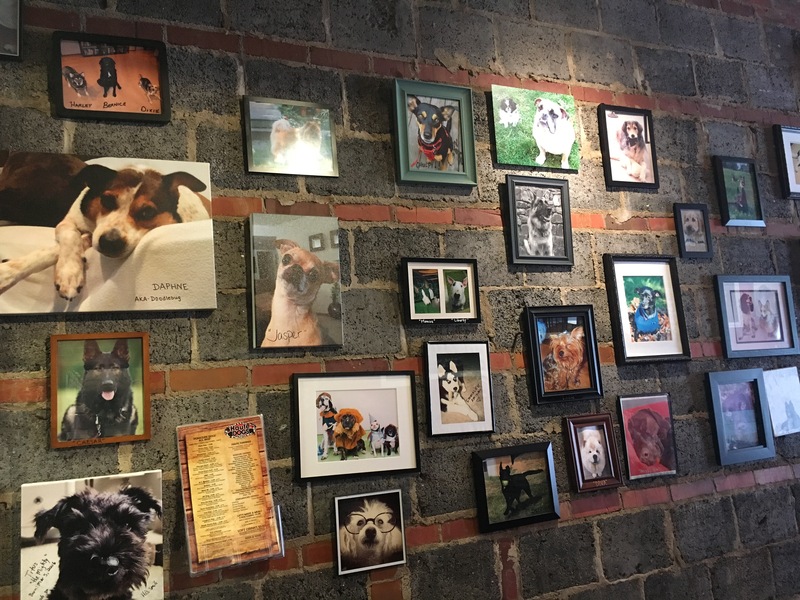 Haute Dogs and Fries is a small venue in the north end of Old Town Alexandria whose focus is on the “dogs”. Haute Dogs opened its doors in this location a little over 5 years ago and has been going strong ever since. If any of you are baseball fans and have been to a Nationals game or two you may have seen their stand at the ball park – this is true Americana, hot dogs, beer AND baseball! I guess you have figured out by now – just by the name of this eatery- that the hot dogs they serve here aren’t your run of the mill “they plump when you cook them” variety. Make no mistake, they have a good old plain hot dog for all of you purists out there (I am actually one of you) but in addition to it they have over 15 other variations. Ranging from the Coney Island – wiener sauce, chopped onion, yellow mustard and celery salt – to the Duck Duck Dog – hoisin sauce, pickled cucumbers and green onion – and everything in between. There is a combination for every palate. They are all beef dogs, but if you are in search of a vegetarian or chicken variety you are also in luck. In addition to all of those choices, there are 20 plus signature toppings to choose from. You have the option to “build your own” on top of this all at an average price of $5.25. Also on the menu are local sausages and burgers, a New England lobster roll, half smokes and fish and chips and, of course….the fries. These are the real deal – hand-cut Idaho number ones fried to perfection. As with the option for the dogs, they have a selection of 7 different dipping sauces as well as just good old Heinz 57. These range from curry ketchup to Sriracha mayo. One order of these fries is plenty for two people unless you are really hungry. Other sides available include baked beans, tater tots, mac and cheese and their famous coleslaw. Check out their “this is how you tot” option on your next visit. 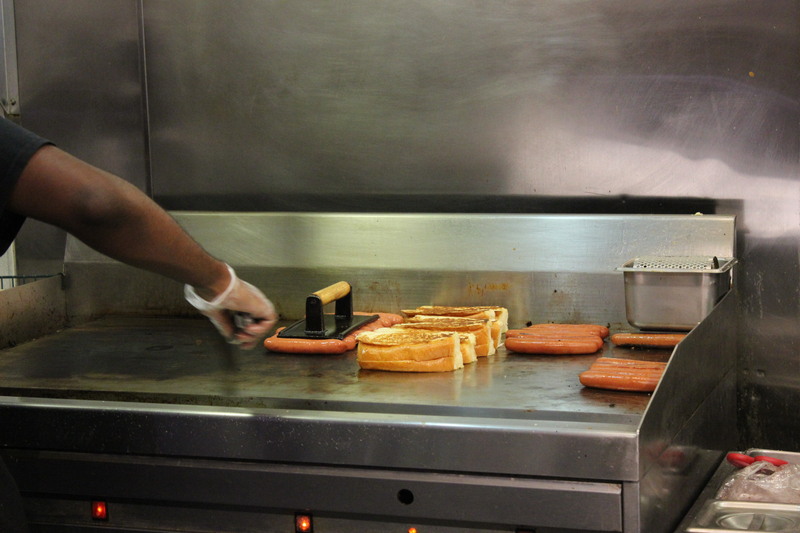 Another thing that sets Haute Dogs hot dogs apart from the norm is the “bun”. Not your standard hot dog bun, the bread they use is more of a take on Texas toast made for them locally and delivered fresh daily. The bun is grilled so it takes on a crispy texture on the outside but remains soft on the inside. It really is hard to describe. Guess you will have to go check them out and decide for yourself. On our last trip to Haute dog I opted for the “Let’s Make a Deal”. The “deal” is you get your choice of any two signature dogs and a soft drink. 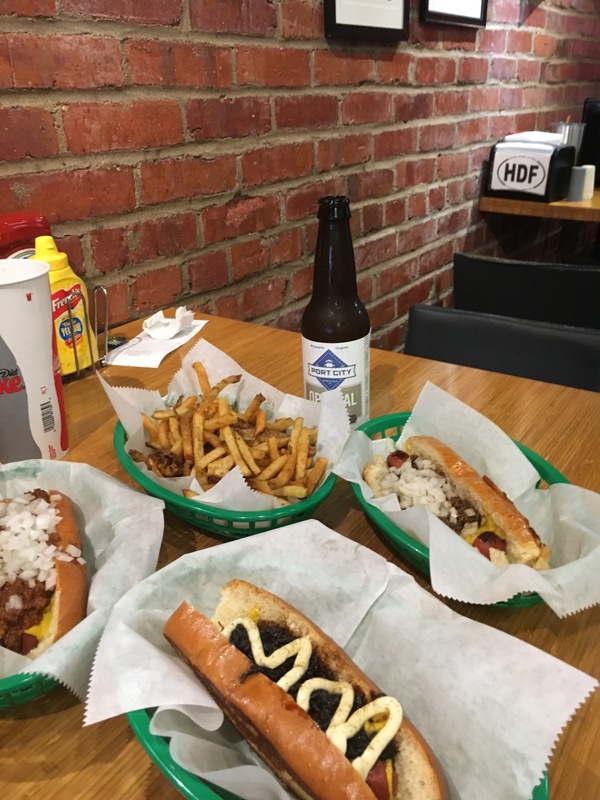 I chose the House Dog – warm onion relish, yellow mustard, mayo and celery salt – and a Coney Island – see description above. I have to admit that my eyes were bigger than my stomach so I only got through one and a bite of the other before pawning the rest off on BT. Be sure you are hungry if you go this route. BT was pretty stoked to see that the special of the day was the Half Smoke so he jumped on it like a big dog……pun intended. All lived up to their descriptions and our expectations. There is a kids menu available and a selection of three ice cream options made from Trickling Springs Super Premium ice cream churned in Chambersburg, PA. Locally brewed beers and a minimum selection of wine are available. I accompanied my dogs with a Port City Optimal Wit and BT went the all-American route and treated himself to a root beer. There really is something for everyone here in this little brick walled eatery including some fun décor that keeps you entertained while you dine. 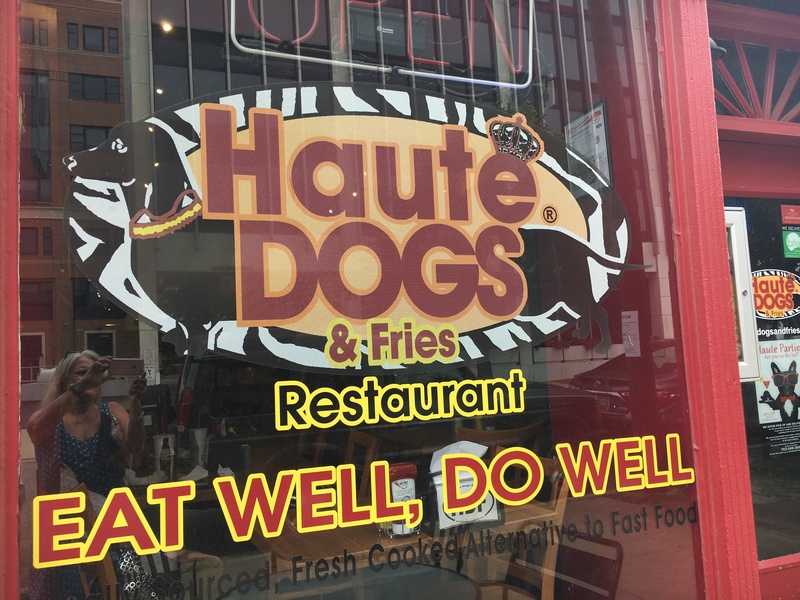 Treat yourselves to a trip to Haute Dogs and Fries during our nations birthday month and have yourself a very Happy Fourth of July! « Christopher Ulllman: Whistling his Own Tune!